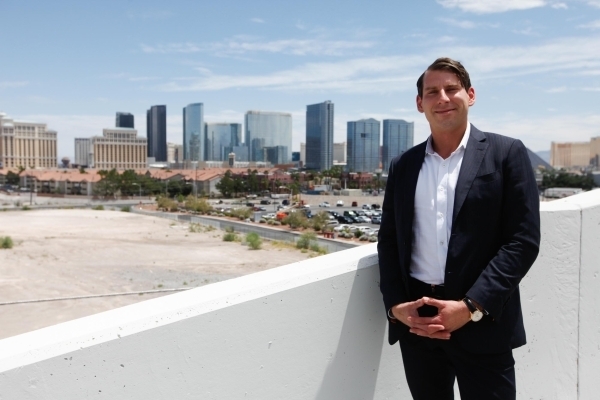 As chief operating officer at Cambridge Cos. Inc., Filipp Chebotarev directs a portfolio of about $300 million in investment property across the Las Vegas Valley. Some of these investments include properties near the Strip and a 52-acre lot pegged for industrial use near Las Vegas and Lamb boulevards in North Las Vegas. Cambridge has also worked on several multifamily projects across the valley. The skill is in the timing. Cambridge re-entered the real estate scene in 2010 after sitting on the sidelines for three years during the Great Recession. Chebotarev said many investors were still a bit shaky on jumping back into the Las Vegas scene at the time Cambridge started to buy property. “We took that chance because we believed in the recovery,” Chebotarev said. “The property values from 2011 until now have increased tremendously,” he said. Since taking his COO position, Chebotarev has helped Cambridge with its investments and lead the way to helping the company in efforts to build product and renovate properties in town. Some of Cambridge’s investments have brought instant success. The company has purchased distressed property that produced instant equity from the day of purchase. And Cambridge has been active in seeking rezoning, both for the purposes of increasing value and to meet the needs of potential clients looking for certain types of properties. Chebotarev is a graduate of the University of California, Irvine. Through his career, he has gained experience in politics, business and organizational development. Chebotarev spent time working for Ed Royce, the congressman from California’s 39th District and chairman of the House Foreign Affairs Committee. He has also worked with a large-scale health care provider, DaVita Kidney Care, and oversaw revenue operations for two of the DaVita’s largest billing regions from the corporate business office in Irvine. At Cambridge, Chebotarev works alongside his sister, Polina Chebotareva, vice president at Cambridge. Cambridge’s founder and president, Michael Bash, has been in the industry for more than 55 years and in Las Vegas for just over 20. In addition to being partners at Cambridge, Chebotarev and his sister also work together on several other ventures away from the company. He said they have 41 other companies, including a food company, a technology and finance company and a merchant bank, just to name a few. But their most recent venture with Cambridge have put the duo near the Strip. Cambridge is in escrow to purchase a nearly 9-acre lot just east of the Palms. He is in talks with Steelman Partners, one of the largest architectural firms in the U.S., and plans for a hotel-casino have been drawn up. Recent drawings show the potential site containing a 1,700-room hotel and 1,600 condo units. Chebotarev said he is in talks with over two dozen potential investors but he hasn’t ruled out the idea of a land sale. Cambridge was initially brought the land deal by a local commercial real estate broker, Zoltan Hollo, managing director at U.S. National Commercial Real Estate Services. Hollo has also assisted Cambridge with several other land deals over the past 18 months including the company’s purchase of 52 acres in North Las Vegas. The site will eventually have a million feet of industrial space. And Hollo sees a good outcome for Cambridge’s industrial projects with the city’s low vacancy rates and the market’s hot demand for industrial space. “Looking at all the indicators, everything looks good right now,” Hollo said.